[Wednesday, June 1, 2011] F-104 jet fighters will become a more regular part of the skyscape as a private company expands its fleet of jets with plans to conduct more research flights, launch very small satellites into space and even take paying passengers into the stratosphere. [Thursday, June 2, 2011] OIG today released a report that found NASA has incurred approximately $304 m in additional costs for an important meteorological satellite due to failures by NOAA and USAF to deliver instruments and other critical components to NASA in a timely manner. [Thursday, June 2, 2011] The three competing universities are (1) Oklahoma State University; (2) University of Maryland; and (3) University of Wisconsin. All three have been in a year-long design, build, and test curriculum that produced this product. [Thursday, June 2, 2011] NASA is seeking comments on the Agency's preliminary plan to conduct an analysis of its existing regulations. The purpose of this analysis is to make NASA's regulatory program more effective and less burdensome in achieving its regulatory objectives. [Thursday, June 2, 2011] We write to ask that NASA quickly open a competitive bidding process or the propulsion component of the new Space Launch System (SLS). A competitive process will allow NASA to procure better technology at lower initial and lifecycle costs. [Friday, June 3, 2011] The agreement states that Teledyne Brown and Aerojet will cooperatively develop, manufacture and market liquid propellant rocket engines for customers such as NASA and other aerospace companies. [Saturday, June 4, 2011] NASA seeks to increase public awareness of the ISS, its visibility, and mission by making ISS sighting information, including personalized notifications, readily available to the general public in an easily accessible and understandable way. [Saturday, June 4, 2011] USRA is part of a multi-organization team led by SRI International that has been awarded a five-year cooperative agreement by the National Science Foundation (NSF) to manage, operate and maintain the Arecibo Observatory in Puerto Rico. [Sunday, June 5, 2011] "RHoK is embracing the concept of 'open innovation', the idea of bringing together thousands of people from around the world to crowd source some of our toughest challenges," said Deborah Diaz, Deputy Chief Information Officer at NASA. [Monday, June 6, 2011] For the first time since arriving on the Isle of Man, Excalibur Almaz Limited will showcase its two space stations and Reusable Return Vehicle (RRV) to the general public June 18. [Tuesday, June 7, 2011] The program intends to mature to flight readiness status crosscutting technologies that advance multiple future space missions. [Tuesday, June 7, 2011] A new way to fly experiments takes off tomorrow with the first campaign dedicated to research in 'partial' gravity. Scientists on Europe's 'Zero-G' Airbus will experiment with gravity conditions like those on the Moon and Mars. [Tuesday, June 7, 2011] The second series of flights in ESA's 'Fly Your Thesis!' programme concluded recently. After many months of preparation, the 10-day campaign culminated with four student experiments making three parabolic flights aboard the Airbus A300 Zero-G aircraft. [Tuesday, June 7, 2011] I appreciate the opportunity to contribute to the goals of President Obama's administration as it relates to improving how IT is managed in the Federal Government. [Tuesday, June 7, 2011] MEASAT Global Berhad ("MEASAT") has selected Astrium to build MEASAT-3b, a new satellite to augment its core Ku-band business in Malaysia, India and Indonesia. [Tuesday, June 7, 2011] The subject guidelines endorses doing away with the term "shall" to mandate requirements and using the term "must" instead. These guidelines were reviewed by the Office of the General Counsel. [Wednesday, June 8, 2011] This action amends flight criteria for mitigating against naturally occurring lightning and lightning triggered by the flight of an expendable launch vehicle through or near an electrified environment in or near a cloud. [Wednesday, June 8, 2011] The Office of the Chief Information Officer (OCIO) is integrating and consolidating many IT services throughout the Agency. This new effort is called the IT Infrastructure Integration Program, or I3P. [Wednesday, June 8, 2011] While it may be that the current administration's plans are not perfect - and a new national debate on space appropriate - these plans stand head and shoulders over the plan that was the latter implementation of the Constellation program. [Wednesday, June 8, 2011] The NASA Minority Innovation Challenges Institute (MICI) is offering opportunities for minority serving institutions to apply for a $5,000 grant to enter the 2012 University Student Launch Initiative (USLI) or Lunabotics Mining Competition. [Wednesday, June 8, 2011] Euroconsult, along with the consulting firm Omnis, today announced the findings of a study today foreseeing a significant shift in NASA spending toward Earth science and R&D programs and away from legacy spaceflight activities. [Thursday, June 9, 2011] Work on the heat shield and thermal protection backshell of the Multi Purpose Crew Vehicle ground test article, or GTA, was completed in preparation for environmental testing. [Thursday, June 9, 2011] To demonstrate a solar-powered exploration vehicle that can operate in darkness using its own stored energy. The prize purse is $1.5 million. [Thursday, June 9, 2011] The NASTAR Center, the premier commercial aerospace training and research center, completed its first annual FAA Safety Approval audit and inspection for the continued use of the Space Training Simulator centrifuge for its Space Training Programs. [Thursday, June 9, 2011] Odyssey Space Research, L.L.C., has announced a space-based, experimental app, dubbed SpaceLab for iOS, which will be used for space research aboard the International Space Station (ISS). »» NBC Nightly News showcases "New Space Race"
[Thursday, June 9, 2011] NBC Nightly News recently featured the commercial spaceflight industry in a piece examining the future of spaceflight following retirement of the Space Shuttle. 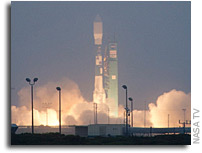 [Friday, June 10, 2011] A United Launch Alliance Delta II rocket carrying the Aquarius/SAC-D observatory for NASA and the Space Agency of Argentina lifted off from Space Launch Complex-2W here at 7:20 a.m. PDT today. [Friday, June 10, 2011] The world's leading air and space event, the Paris Air Show, will open its doors for a week on 20 June. The salon will include a strong ESA presence, highlighting its activities for the benefit of space experts and the general public. [Friday, June 10, 2011] UNCOPUOS concluded its fifty-fourth session and its deliberations over ways and means to maintain outer space for peaceful purposes and to ensure that space technology and its applications continue to benefit many areas critical to all humanity. [Friday, June 10, 2011] The goal of the forum is to promote opportunities for research and technology development and feature accomplishments and opportunities for future research aboard the space station among commercial, academic, government and other institutions. [Monday, June 13, 2011] Thai satellite company THAICOM Plc. has chosen Space Exploration Technologies (SpaceX) to launch the new Thaicom 6 telecommunications satellite into a geosynchronous transfer orbit (GTO) from its Cape Canaveral launch site in the second quarter of 2013. [Thursday, June 16, 2011] Government is almost exclusively the buyer of civil space infrastructure, with the notable exception of telecommunications satellites, which are very good example of a successfully sustained space economy in geostationary Earth orbit. [Friday, June 17, 2011] NASA issued a Broad Agency Announcement (BAA) seeking proposals for mission concept studies of a solar electric propulsion system demonstration to test and validate key capabilities and technologies for future exploration missions. [Monday, June 20, 2011] ESA Director General Jean-Jacques Dordain met EDA Chief Executive Claude-France Arnould at the Paris Air & Space Show today to sign an Administrative Arrangement on cooperation between ESA and the European Defence Agency. [Tuesday, June 21, 2011] ESA and Thales Alenia Space Italia announced an agreement today at the Paris Air & Space Show to begin building the IXV Intermediate eXperimental Vehicle for its mission into space in 2013. [Tuesday, June 21, 2011] The two Soyuz launchers that will fly the first four satellites of Europe's Galileo navigation system into orbit have arrived at Kourou harbour in French Guiana, completing a journey that took them halfway round the world. [Wednesday, June 22, 2011] NASA Inspector General Paul Martin today released a report that examines the $32.8 million re-siding project for Hangar One - one of the world's largest freestanding structures - at NASA's Ames Research Center in Silicon Valley, California. [Wednesday, June 22, 2011] Alphabus, the world's largest communication satellite platform, is ready to offer new opportunities for satellite operators worldwide. [Wednesday, June 22, 2011] The new main engine to power Europes successor to its Ariane 5 space launcher was brought a step closer today when ESA signed a 60 million contract with a propulsion consortium at the Paris Air & Space Show. [Thursday, June 23, 2011] Fire acts differently in space than on Earth. Sandra Olson, an aerospace engineer at NASA's Glenn Research Center, demonstrates just how differently in her art. This artwork is comprised of multiple overlays of three separate microgravity flame images. [Thursday, June 23, 2011] "Whether it's timidity from the White House or Congress' earmark-laden 'compromises', our space dreams will be stuck on this planet unless someone articulates a vision based on economic and technical reality, so that's what we've done." [Friday, June 24, 2011] UrtheCast is building, launching, and operating the world's first and only high definition streaming video cameras being installed on the International Space Station (ISS). »» What's Next for America after the Space Shuttle? [Friday, June 24, 2011] Rear Admiral Craig E Steidle, the president of the Commercial Spaceflight Federation will be at the Kennedy Space Center on July 7-8 to discuss the legacy of the Space Shuttle and to help answer the question "what's next for American human spaceflight?" [Monday, June 27, 2011] The event brought engineers and policy makers from across NASA together with well-respected members of the open source community together to discuss current challenges with NASA's open source policy framework. [Wednesday, June 29, 2011] The final flight of the Space Shuttle Atlantis is scheduled for July 8, 2011, at 11:26 a.m. EDT. This will be the last mission of the Space Shuttle program. [Wednesday, June 29, 2011] The proposed centrifuge system, based on a standard experiment container system, was developed by Astrium for ESA more than 25 years ago and has been used for more than 120 experiments for various topics. [Wednesday, June 29, 2011] NASA's industry partners have met all their initial milestones in developing commercial crew transportation capabilities to reduce the gap in U.S. human spaceflight capability.